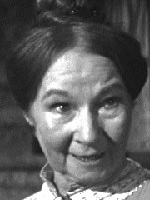 Paula Trueman played several mischievous old ladies in the 1970s and 1980s. Ah Paula Trueman. One of my favorite bits of dialogue ever involved her small part in "Paint Your Wagon." Mrs. Fintey - You should read the Bible, Mr. Rumpson. Rumpson - I have read the Bible Mrs. Fintey. Mrs. Fintey - Didn't that discourage you about drinking? Rumpson - No...but it sure cured my apatite for reading.